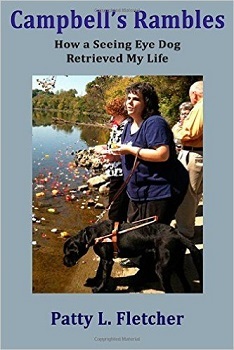 Campbell’s Rambles is the story of how the author obtained her first guide dog, Campbell, from The Seeing Eye™ in Morristown, New Jersey: what motivated her, the extensive training she had, the special relationship she developed with her trainer, and the good friends she made. Once she returned home to Tennessee, there were many new challenges to be met and overcome, including domestic abuse. All that was in addition to her chronic conditions of bipolar disorder and fibromyalgia. With honesty, courage, and humor, Patty Fletcher tells a remarkable story of personal development and persistence that is sure to inform, entertain, and inspire others, both blind and sighted.